The price for treating both eyes with gene therapy could be $1 million. (Bloomberg) — A gene therapy maker showed this week it could make blind children and adults see. But the big question left is how long the effect will last. Much depends on the answer, including how much the company can charge for the drug — a price tag some say could be more than $1 million a patient. On Saturday, the Philadelphia biotech firm, Spark Therapeutics Inc., reported encouraging data on that front. Spark’s gene therapy, which treats certain rare inherited eye disorders that cause blindness, has maintained for three years the improved vision of patients who completed an early-stage trial, the company said. In a widely anticipated presentation on Saturday at a conference in Paris, Spark also revealed more details of a final-stage trial, showing how it helped improve vision in 31 people. Together, the two data sets may help Spark’s treatment become the first gene therapy to market in the U.S.
After years of setbacks, a resurgence of gene therapy — curing diseases by injecting new genes into the body — has come this year from improved technology and promising early trials. Spark, along with biotech companies like UniQure NV, Bluebird Bio Inc. and Applied Genetic Technologies Corp., are all developing treatments for disorders caused by mutations in a patient’s genetic code — inherited eye disorders, hemophilia and sickle cell anemia are leading candidates. Marrazzo, 37, was part of the group that founded Spark, which was a built on work from a team of researchers at the University of Pennsylvania and the Children’s Hospital of Philadelphia. The company went public on Jan. 30, and shares are up more than double their IPO price, valuing the company at $1.21 billion. Both pieces of data Spark has released this week show that “with lots of expertise, if you pick the correct target, and run a well controlled study, and get all the little details right, you can do this,” he said on his way to the airport to attend the Retina Society Annual Scientific Meeting in Paris, where the three-year data was revealed. Spark’s gene therapy “is the hottest thing in medicine right now,” said Julia Haller, ophthalmologist-in-chief at the Wills Eye Hospital and president of the Retina Society. Correcting genetic defects that make people sick “has been the holy grail for a long time and now we are a huge step closer.” Haller, who was an unpaid consultant for the final-stage trial, spoke in an interview before the new results were presented. 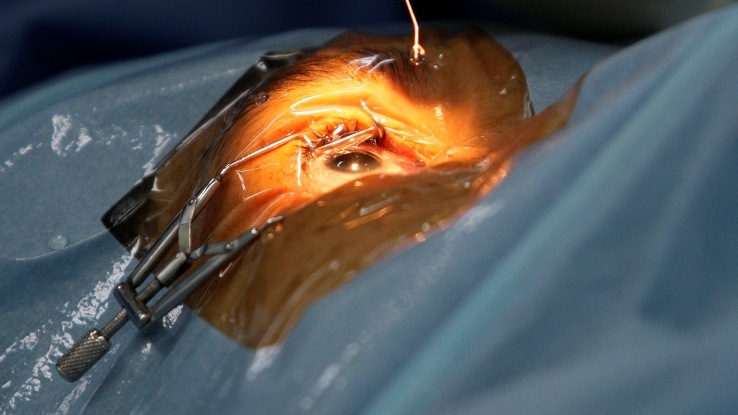 Spark’s treatment, SPK-RPE65, is injected directly into the eye, using a virus to deliver a correct gene to a patient whose original gene is mutated. For its final-stage trial, Spark measured the amount of light a participant needed to navigate a mobility course, which entails following arrows on the floor and avoiding obstacles. Participants were tested at seven different lighting levels, the lowest corresponding to a moonless summer night and the highest to a brightly lit office. After a year, patients treated in both eyes improved by 1.9 light levels, compared with an improvement of 0.2 levels in the control subjects who hadn’t been treated, according to an analysis of the 29 patients, a mix of children and adults, who completed the trial. Two patients in the cohort dropped out before treatment was administered and were not included in the analysis, said principal investigator Stephen Russell of the University of Iowa, who ran the trial. Since the final-stage trial only has tracked patients for a year, Spark also presented at the conference the longer-term data on patients who had been treated in an earlier study and were available for follow-up. Out of eight patients who would have qualified for the final-stage trial, all seven who were available for follow-up after three years sustained their improvement, Russell said in a telephone interview. The data are “really convincing” and bode well for the long term, said Russell. The finding of durability may help ease concerns that Spark’s therapy wouldn’t hold up to the promise reflected in the biotech company’s stock ticker — ONCE. In theory, if gene therapy can fix or replace a broken or missing gene, effects could last for the rest of a patient’s lifetime. Two academic studies that didn’t use Spark’s treatment, published in May in the New England Journal of Medicine, found that the effect of gene therapy for the same category of eye disease appeared to wane with time. Spark’s shares tumbled that day as investors worried that the treatments may not hold up, even if they work initially. Jean Bennett, a professor of ophthalmology at the University of Pennsylvania and a co-inventor of the technology Spark’s treatment uses, said there are key differences in design and manufacturing that could make the company’s therapy longer-lasting than those whose effects faded. While the general concept is similar, “ours is a totally different drug,” said Bennett. Her team and Spark spent years optimizing the manufacturing and design of the therapy to make it as efficient as possible at delivering copies of the new gene into the eye, she said. Spark also took extra steps in production to make sure the treatment contains no duds, or empty viral particles that are missing the new gene, potentially diluting the treatment effect, Bennett said. Bennett and her team showed they could make blind dogs see in 2001, but for years couldn’t find a company — or anyone — interested in testing it in people, until Children’s Hospital got involved. Success in early trials at the Children’s Hospital led to the founding of Spark. Based on the results of its trials, Spark plans to submit the treatment to U.S. regulators for approval next year, the company said Monday. If approved, the gene therapy is expected to be among the most expensive drug treatments in history. At least two analysts are projecting sales of SPK-RPE65 based on a $1 million price tag for both eyes. The first gene therapy approved in Europe, made by UniQure, debuted in November with a price of as much as 1.1 million euros ($1.23 million) per patient. Spark says about 3,500 people in the U.S. and five major European markets have eye disorders resulting from a mutation in the RPE65 gene. CEO Marrazzo has said the biotech company is considering selling the therapy in installment plans to make it easier for patients and health insurers to spread out the payment over time. The three-year data may help Spark make a case with insurers for the drug’s value, Marrazzo said Friday. “It will open conversations with payers because we now have demonstrated durability and it also lets you walk in and say, ‘We have a way to measure the effect, to see if it can continue,’” he said. Marrazzo said he doesn’t know yet what form of payment plan Spark will negotiate with insurers. Even if the effects of Spark’s therapy aren’t permanent and start to fade beyond three years, patients may still want the drug. If the treatment were to last even just eight years, “all the patients I have would sign up to be treated,” said Eric Pierce, an associate professor of opthalmology at Harvard Medical School, was involved in the first trial of the drug, but not the final-stage trial. Spark’s progress in approval and reimbursement is likely to be watched closely not just by patients and doctors, but also investors. Usually the Retina Society meeting is open only to its members — leading retina experts from around the world — but Haller said the group was inundated with requests from Wall Street analysts to see the gene therapy presentation and decided to let them in as long as they don’t ask questions. “Investors will look at the data and are going to go, ‘Wow this is the best data we’ve seen, not just in the eye, but on gene therapy, period’ and they’re right,” said Russell, the principal investigator. Yet he cautioned that more information is needed before the drug can be considered a cure. While it produces a missing enzyme needed to sense light, it can’t restore light-sensing cells that have already died off due to the progressive disease. In the study released Monday, one standard measure of vision, visual acuity, didn’t improve by a statistically significant amount. Spark also hasn’t finalized and published data on individual patients, and it’s possible that some responded better than others. Age in particular may be a factor in how much a patient can improve, said Russell. The company said in a statement that no serious adverse events were seen so far in the trial. The drug is likely to be scrutinized intensely by regulators at the U.S. Food and Drug Administration, given the mixed history of gene therapy and the many unknowns about its long-term effects.